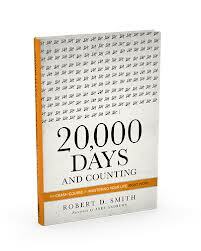 At the age of 54, Robert D. Smith suddenly realized that he had been alive for 20,000 days. While he knew how many days were behind him, he has no idea how many days remain in his life. With this in mind, he determined to set a course to be more mindful of the important things in life. He set out to live his life in a more purposeful, deliberate way so that he would not get lost in the “everydayness” of life. He advises the reader in several ways that they can also live their remaining days to the fullest. The first thing one must do is accept and embrace the idea of death. Once we face our own mortality, we can begin the process of planning how to live. One of the things he suggested was to create a “Life Purpose” statement. He gives the example of people who have had near-death experiences and afterwards live profoundly different lives. He suggests simply writing ideas on a piece of paper until you are able to refine your purpose into one sentence that fills you with joy and excitement. After this, it is up to each of us to continually focus on the purpose statement in order to live a meaningful life. Another suggestion is that we should celebrate more often. Waiting until goals or milestones are reached before celebrating will not guarantee that the outcome will be worth waiting for. Celebrate the small achievements every day (even if one of them is waking up in the morning!) and life will be more enjoyable. I also love his suggestion to always order dessert first before you fill up on all those other calories. The final section of the book contains some questions to ask yourself and activities to help you seize the day and make today more important. I believe the overall suggestion of the book is to experience gratitude, reach out to others, and project a feeling of happiness every day in order to make your next 20,000 days more meaningful. The book also includes a link to the author’s website to determine how many days you’ve been alive, which will probably amaze you, but also spur you on to make the upcoming days more significant.